Socks were on sale so I decided to give them a whirl. I had scanned my mom’s kimono a couple of years ago. 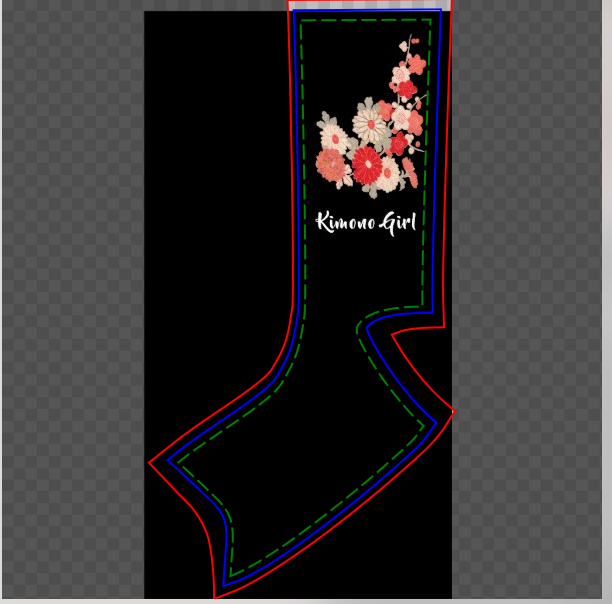 I decided to cut out a sprig of the flowers for the sock in Photoshop. I carefully lassoed and erased around the flowers. I know a lot of people mask but I found I get better results with lassoing. I could have floated that on the white tube socks but I decided to drop it on a black background for contrast. So I uploaded it to Zazzle and the picture looked good although it looked like the black became a dark charcoal. I set it up to have a black background. I got the package and it looked good in the package but I saw at the top and inside, the sock was white. They printed the design on top of white; the sock itself was not black. I had expected the sock to be black inside and out under the design because I had chosen a black background. It turns out the design is printed on a white sock on the surface of the outside of the sock and that includes the background. The inside remains white. Also my black sock, while it looked black indoors, was a steel blue in bright sunlight.I was okay with the steel blue actually. It was a good combination with how pinkie the flowers ended up printing instead of the more scarlet red I had uploaded. I was okay with the inside being white. The way I placed the design, it’s not meant to be folded down and the white rim echoed the white print. The other issue was that when it stretched out you could the white ribbing inbetween. The big issue though was not the white ribbing you can see once the sock was stretched out on your foot. It was the black line going down the middle. Because my design did not print as black even though the color was set at 000000 — that means solid black — there was a streak of black down the middle of the sock. Their black background did print as black. If I hadn’t chosen black as the background though, I wonder if I would have had a white line going down the middle. Now I understand why almost all the designs I saw on Zazzle socks used a white background. That way if a white line showed, it’s a nonissue. This was not good. I had filled up their design even past the front of the sock so there shouldn’t have been a line down the front center like that. While usually there is not a downloadable template on Zazzle, there were for the socks. However when I uploaded the tiff, the image was a little shorter then the online template. However there was no white or black line at the top edge of the sock where the design was printed so that didn’t appear to be an issue. The other thing is that the large black — or now steel blue — of most of the sock did not print evenly so that it almost looked like it had large horizontal stripes or blocks on the foot. Other than that, the quality of the sock felt pretty good. It’s a solid sock with a nice finish on it. I liked the feel of the sock. I loved how my design looked. I loved the flowers from my mom’s kimono and the text Kimono Girl — Kimono for my mom’s kimono and Girl for the girliness of the flowers. If it were not for that black line and the stripey look across the top of my foot, I’d love the sock. Zazzle gives a 100% satisfaction guarantee so I could send it back and they were expensive. Even at 40% off, they were $12.64 plus tax. It’s obvious I can do the design in white but not with a color background and I like the flowers on the steel blue. I really love the top part with the flowers and Kimono Girl, sighs. I am thinking of keeping the sock and dying the foot part up to where the leg ribbing part a black to cover up the stripe. It would be a two-tone sock — the bottom foot part being black and the ankle part being steel blue with the flowers. I don’t know. I’ll have to think about it. It’s a learning curve. If I do a sock design again, I’ll do a white background. That’s also my advice for you.